Alice Blue Legs' mother died when Alice was young, and her father, Joseph New Holy, instructed her in the importance of quillwork and other skills. "He didn't show me," she said, "he just told me what to do.... It was something I had to learn. Every Indian girl was supposed to learn how to do quillwork and beadwork and tanning hides, so they will know rather than going to the traders and buying them. All Indian girls had to learn quillwork as well as to take care of the house and cook." 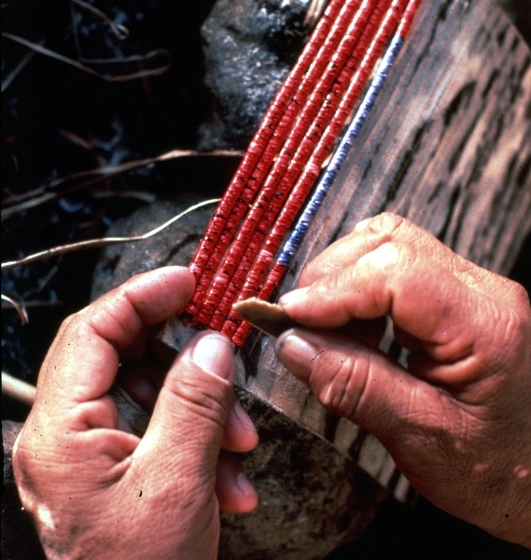 Before European explorers and settlers introduced trade beads to Native Americans, porcupine quills were often used in the decoration of clothing, horse trappings and other regalia. 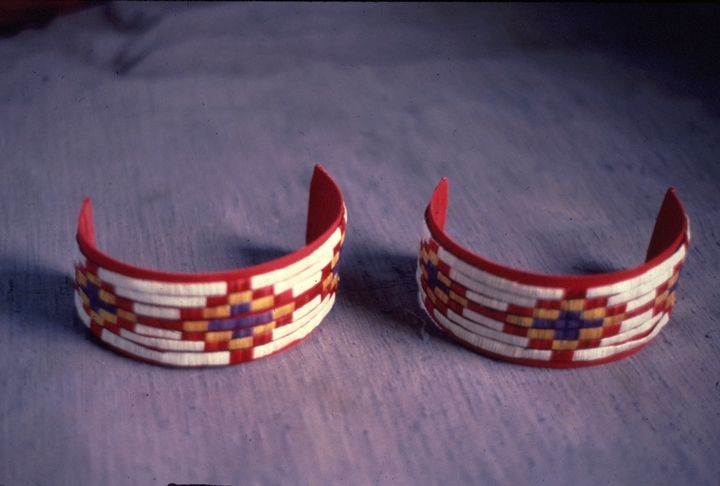 Quillwork was relatively common among the woodland and plains Indians but was especially prominent among the Lakota Sioux. 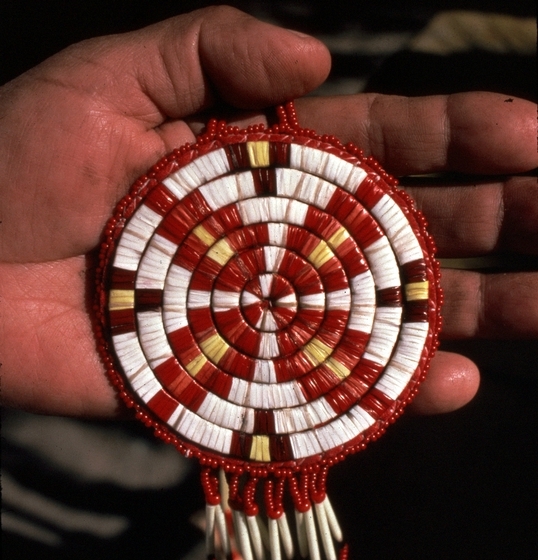 Quillwork was extremely complex, requiring a high degree of skill, experience, and patience, and as trade beads became more readily available, easier beadwork techniques replaced quilling. The Blue Legs family hunted porcupines with trained dogs. "The best time to hunt is before a storm," Blue Legs said. "They come out of their dens a day or so before a storm. The dogs know. They track them and start barking." They might get as many as twelve porcupines in one hunt -- not a lot, considering that they might use the quills of two hundred animals in a season. Porcupines are laid on a table in the yard until their quills can be pulled out. After the quills are removed, they are sorted by size. Piles of quills are sorted first on a coarse screen, then on a finer one. Next, they are washed in hot, soapy water and a disinfectant, then rinsed. After being dried, they are dyed with Rit liquid dyes. Most of Blue Legs' work is wrapped or stitched. 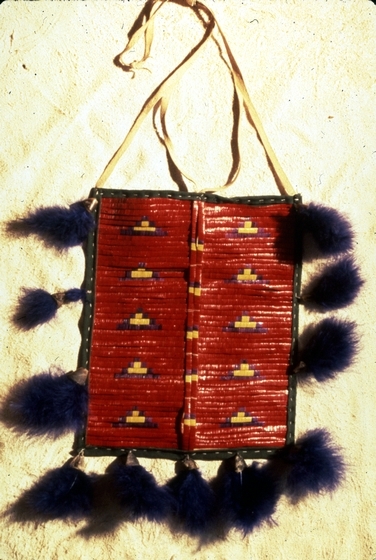 In the wrapping technique, the flattened quills are wound around a strip of buckskin. This is used for fringes and jewelry. 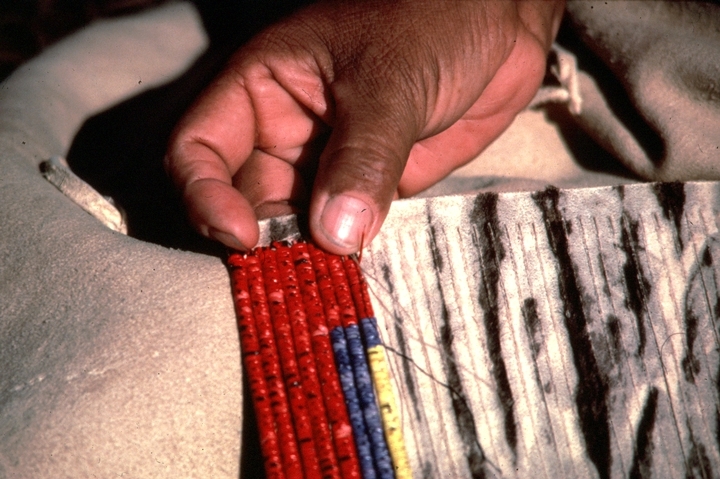 The stitching method is used for decorating buckskin dresses and other flat surfaces. 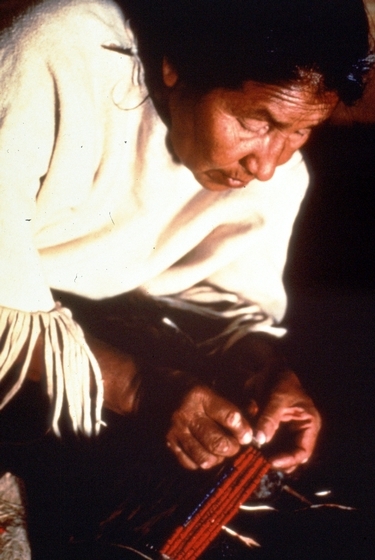 The third major technique, plaiting, is used primarily for decorating pipe stems and tampers. Blue Legs has used this technique, which she described as the hardest of the three, but it is used more by men in the family. 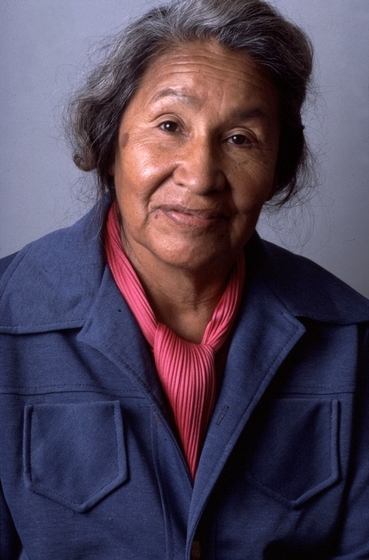 Alice Blue Legs continued living in the log house on the Pine Ridge Reservation in which she was born. 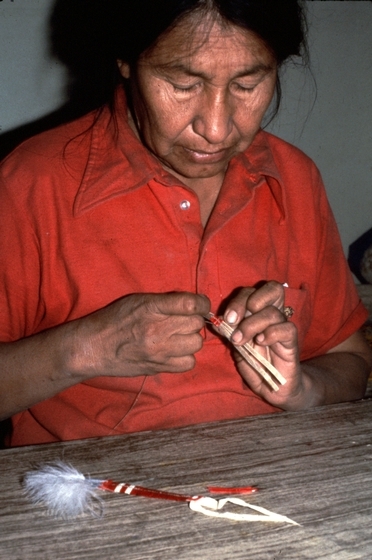 She and her husband, Amil, also a skilled quillworker, made their living from crafts. The work is long and difficult, but rewarding. "This is a dying art which I'm trying to revive," Alice said. A single breastplate can involve more than 1,000 quills. Amil learned quillwork from Alice, who also taught the craft to her five daughters and three of her grandchildren. On one occasion, Amil made a man's breastplate, 12 inches by 18 inches, using 5,640 quills, in only four days. "The hardest part," Amil joked, "was counting the quills." 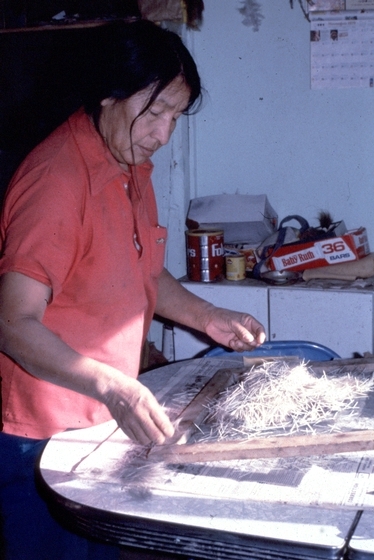 Over the years, Alice and her family have given workshops and demonstrations in many places across the nation, including the Sioux Indian Museum Shop in Rapid City, South Dakota; the Buffalo Bill Historical Center in Cody, Wyoming; the University of South Dakota at Vermillion; Dartmouth College; and the Children's Museum in Indianapolis. "I feel like I, at least, try," she said, "to give the white public what it is like to be an Indian in modern day and [to be] an old-style Indian." 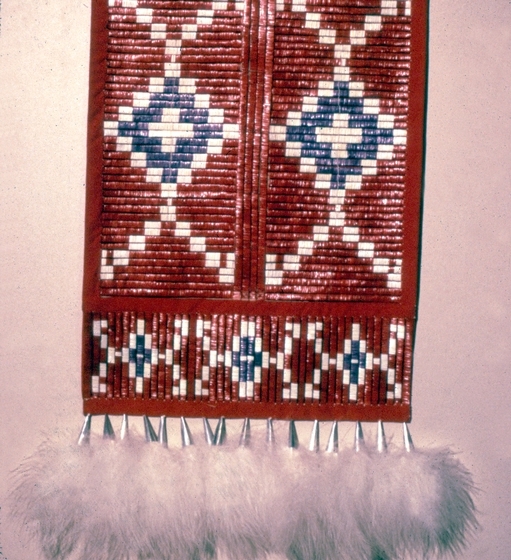 Lakota Quillwork-Art & Legend. 16mm, videotape, color, 27 minutes. Produced and directed by H. Jane Nauman. Custer, South Dakota: Nauman Films, 1990.